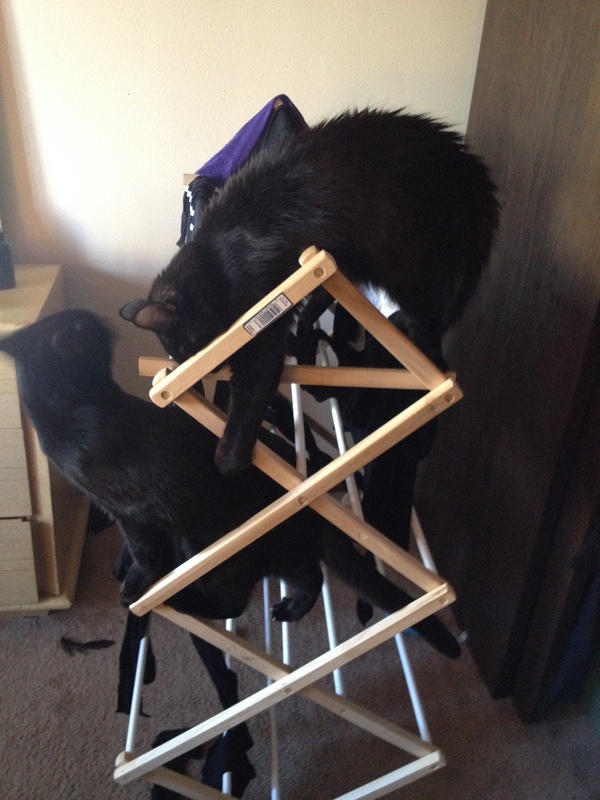 The Wild Woman, aka Sophie, has taken up a new sport: Drying rack gymnastics. The first time I saw her up there I immediately, and very carefully, took her off of it and put her firmly on the ground. Immediately, she was up on it again. Grizzy watched from the sidelines, but I could see the gears turning. Little Miss Spitfire makes him brave, it seems, and sure enough, he started climbing up the drying rack. (Only haha, in typical cautious Grizzy form, he was very slow and stayed near the bottom.) I pulled him off, he jumped back on. 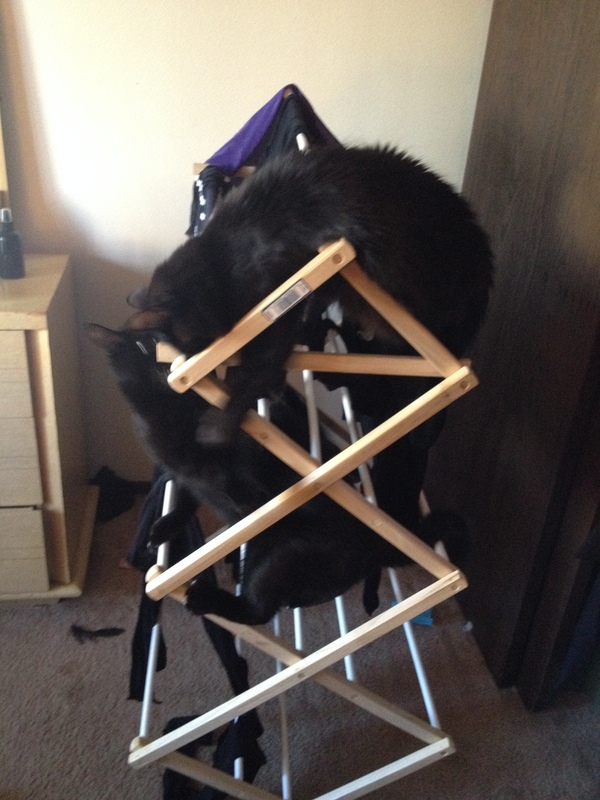 I figured since they seemed to be climbing without issue, I’d let them have their fun for a couple minutes. And I took the opportunity to get a couple pictures. In the top picture, Sophie isn’t hung up – she’s actually leaning down to swat at Grizzy. In the bottom one, he tried to retaliate. It was the slowest, funniest “battle” I’d ever seen. It also lasted all of 10 seconds; they tired pretty quickly and hopped off so they could commence more exciting activities: grooming. Ah, kitties. What won’t you climb? Susan, this was hilarious. So glad you took pictures of them in action. Who needs TV when we have furkids to keep us entertained. They just don’t know how darn cute they are to us humans. Oh my gosh, I missed this until today! That is hilarious!